Available in a huge range of colours and styles, festoon lighting is a popular choice for weddings and events, as well as gardens in need of light and character or a bold interior design lighting choice. Whether you're throwing a party or want to add something special to your outdoor space, our collection of beautiful festoon lights really does have something for everyone. Everyone loves an outdoor celebration - at least when it's not raining anyway! 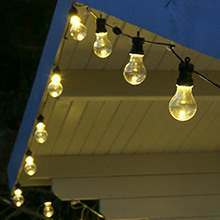 Garden festoon lighting is the perfect accompaniment to any feel-good gathering, with large eye-catching bulbs providing practical and decorative light long into the night. These oversized globe type bulbs come in the traditional light bulb shape as well as in different shapes and sizes, with some adopting a filament style LED for a truly vintage look. Here at Festive Lights, we have an extensive selection of festoon lights both for indoors and outdoors, available at great prices, browse our range now to get started. If you have a business in need of unique interior lighting or want something different in your home why not try out our indoor festoon lights. Our outdoor festoon lighting is perfect for lighting up the garden, pathways and decking to create a unique outdoor experience you can enjoy all year round, or if you have a large outdoor commercial space that needs lighting. Have an event you need lighting, we can help, we have a selection of festoon wedding lights, allowing you to create the right ambience on your big day. We also have a selection of festoon lights for events such as celebrations, corporate parties and festivals. Choose from frosted, clear and multicoloured bulbs in a range of styles from vintage tulip, and traditional style LED filament bulbs to cool simple modern globe designs. Find the right aesthetic for your needs with festoon lighting from Festive Lights. Our festoon lights also come in a range of belt lengths, and we also have connectable festoon lighting which allows you to easily extend the reach of your festoon lights without having to plug in a new set to the mains. This is a great option if you are looking to string lights across a large space such as a barn, marquee or tipi tent. 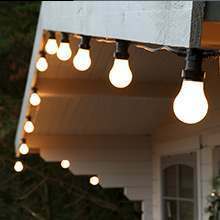 You can also choose different drops with our drop festoon belts to add depth to existing festoon lighting. We also have commercial festoon lighting; FestoonPro 240V Connectable Festoon Lights is a great choice if you're looking to adding cosy lighting to your bar or restaurant or if you have an outdoor area that you want to add subtle lighting too. This range is designed for commercial use with exceptional build quality. 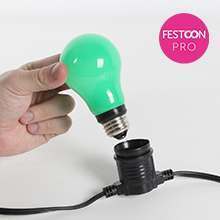 Festoon lighting is perfect for parties, relaxing outdoors, events large and small and for the home, get yours today.